How Uncertainty In The Korean Peninsula Could Be A 'Recipe for Disaster' : Parallels President-elect Trump's statements on North Korea have reflected contradictory aims. Political turmoil in South Korea and Pyongyang's nuclear capability make for a mix that worries Korea-watchers. 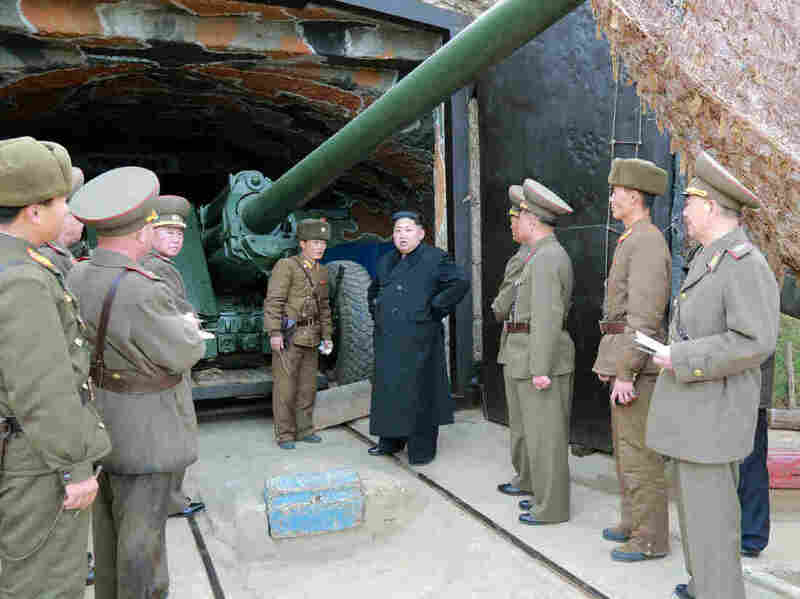 This undated photo released by North Korea's official Korean Central News Agency on Nov. 11 shows North Korean leader Kim Jong-Un at a defense detachment on Mahap Islet. As in so many foreign policy issues, there's considerable confusion about what U.S. policy toward North Korea will look like under President-elect Donald Trump. Pyongyang's expanding nuclear capability will not be something he can ignore. "The likelihood today of a nuclear catastrophe somewhere in the world is greater than it was than during the Cold War — greater than during the Cold War," former U.S. Defense Secretary William Perry said in Seoul a week after the American election. He doesn't think a catastrophe will come from a nation launching an actual attack, but rather through an accident. "The danger is we blunder into a nuclear war. The reason we are blundering into these positions is that people do not understand the dangers," Perry said. One of the dangers is North Korea's growing nuclear arsenal, estimated at anywhere between 10 to 16 warheads and an unclear number of bombs. Pyongyang twice this year tested nuclear devices and has launched missiles dozens of times. It is the only nation in the world to have tested nuclear weapons in the 21st century. "When it comes to changing Pyongyang's behavior, it's tough," President Barack Obama said in September, acknowledging the fruitlessness so far of efforts to stop or slow North Korea during his time in office. "It is entirely fair to say they have continued to engage in the development of their nuclear program and these ballistic missile tests. And so we are constantly examining other strategies we can take," Obama said. That examination is about to be passed off to America's new leader — whose statements about North Korea have run the gamut from saying he'd sit down with Kim Jong Un over a burger to suggesting American allies South Korea and Japan should develop their own nuclear weapons. Where does that leave Northeast Asia? "Key words, I think, are uncertainty and anxiety," says Bruce Klingner, a North Korea specialist for the conservative Heritage Foundation think tank. "If [Trump] goes against sanctions or fails to implement them more fully, if he seeks a bilateral summit without consultation with our allies, he'll run into strong congressional resistance," Klingner says. Klingner favors tougher sanctions. The U.N. Security Council ordered stricter sanctions on Pyongyang in the spring, but by the time of North Korea's second nuclear test of the year, it was clear the measures didn't accomplish much. The U.N. has yet to come up with a response to the latest nuclear test. "The further we go in time, they will get better at doing what they intend to do, which is to have a deterrence capability that has the ability to reach the United States. So this is a matter, I think, which should be a concern for everyone," said James Kim of the Seoul-based Asan Institute for Policy Studies. Even if North Korea has no intention of using its nuclear weapons, Perry worries it could sell a bomb to a terrorist group, for example. So a lot is at stake in the region, and nothing's coming easy. In South Korea, a domestic political scandal has crippled President Park Geun-hye. Her approval rating is at 5 percent and her administration is besieged by protests and calls for her to resign. This is only raising the jitters, as uncertainty piles on uncertainty. "Having [an] uncertain Asia policy by Trump, by having the uncertainty of the domestic political crisis in South Korea, and then the uncertainty of what Kim Jong Un would do — it could be a recipe for disaster," Klingner says.